The Australian native emu is an extremely fast runner but it can’t fly. 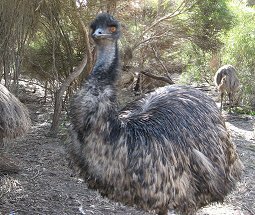 The emu was a valuable source of food for the Aboriginal people and was also used in ceremonies and medicine. Dutch explorers came across three toed tracks about 1697 in Western Australia. The name is derived from Portugese word “Ema” meaning crane or large bird. It is important to cut across the grain to reduce shortening during cooking. To maximise tenderness and flavour the meat should be served slightly rare – definitely not well done! When grilling, the meat should be cooked quickly at a high heat in a pre-heated hot pan and removed from the heat just as the juices are starting to rise. Allow to stand for a few minutes before serving. Low in fat, the meat is ideal for wok cooking. Cooked quickly over high temperature prevents loss of juices and seal in the unique flavour. Mix together 2 Tbsp. garlic, 1 Tbsp. salt, 1 Tbsp. Ground Pepperberry, 2 Tbsp. Native Thyme, 2 Tbsp. rosemary, 2 Tbsp. Native Basil, 2 Tbsp. Sea Parsley and spread half the mix over a 2-3kg emu roast. Marinate 4-6 hours in fridge. Place in roasting pan, spread the remaining spice mix over the meat and add the ¼ cup macadamia oil and 2 cups red wine before placing into a 180C oven for 1.5 to 2 hours. Baste every 20-30 minutes with pan juices. Serves 8-10. Emu meat will continue to cook after removal from the heat, so let the meat set for several minutes before cutting. Always cut against the grain of the meat. Cut 200gm emu fillet across the grain into strips. Marinate in a small bowl with red wine and 3 tspns Outback PrideTanami Fire for 1 hour. Thread emu strips onto presoaked bamboo skewers. Heat a griddle pan and brush with olive oil. Grill emu for a couple of minutes either side until cooked.